Yesterday, a client of LEWIS & DICKSTEIN, P.L.L.C. 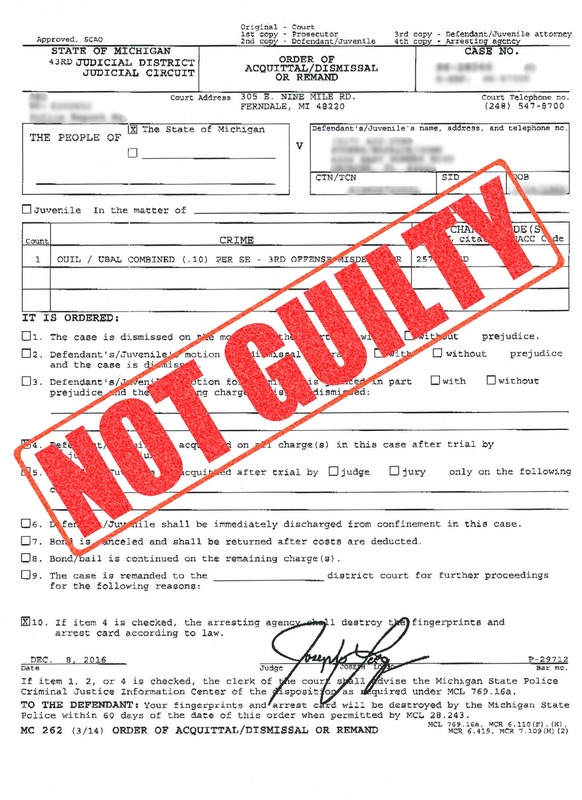 was found not guilty of Operating a Motor Vehicle While Under the Influence of Liquor, 3rd offense in Oakland County. Senior-level trial attorney George MacAvoy Brown handled the case. With every matter the firm takes on, the attorneys immediately search for the possibility of a dismissal. If none exists, they begin compiling a defense against the charges, forcing the prosecution to meet its burden of proof, and determining whether a resolution can and should be reached. Prosecutors know that the attorneys at LEWIS & DICKSTEIN, P.L.L.C. are not afraid to win so they often bring great deals to the bargaining table. In this matter, the client was charged with an OWI 3rd offense. He wisely began mounting the best possible defense by hiring the attorneys at LEWIS & DICKSTEIN, P.L.L.C. Diligent research revealed severe flaws in the prosecution’s case. First, the police had illegally arrested the client. To be arrested for a misdemeanor, the police need an arrest warrant unless they have either personally witnessed commission of the crime or they are investigating a car accident and have reasonable cause to believe the person’s driving was affected by the consumption of alcohol. In this case, the prosecution claimed the defendant was never arrested and, even if he were, alleged an accident had occurred forcing application of the statutory exception. Attorney George Brown successfully persuaded the court that there was an arrest and no accident. The arrest was therefore deemed illegal and the judge ruled that any evidence gathered after it was suppressed. Not satisfied to place all their eggs in one basket, defense counsel also attacked the validity of the breathalyzer test. The police department is required by Michigan administrative rules to run calibration and maintenance tests on its breathalyzer machines to ensure the legitimacy of their results. Law enforcement must keep those records for the purpose of laying a foundation to introduce the results at trial. Here, the police department had destroyed all logs related to its machine. Defense counsel filed a compelling motion to suppress the results of the test in the client’s case, arguing that the prosecution had failed to properly lay a foundation for the introduction of the breathalyzer results. After suppression of the breathalyzer test, the prosecution still maintained that it had enough evidence to win a conviction, so the defense team took the case to trial. 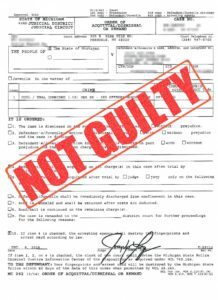 Without the breathalyzer evidence, Mr. Brown successfully argued that the prosecution had failed to produce evidence against the defendant adequate to demonstrate guilt beyond a reasonable doubt. The defendant was found NOT GUILTY! He expressed that he is “truly, eternally grateful” to his attorneys for the acquittal. 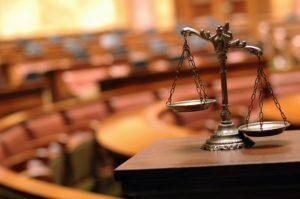 If you are being prosecuted for a crime in Oakland County, Wayne County, Macomb County or elsewhere in Michigan, it is critical that you even the playing field by assembling the best possible legal team to fight for you. The diligent, methodical, creative, and aggressive attorneys at LEWIS & DICKSTEIN, P.L.L.C. will deconstruct your matter to examine all weaknesses in the prosecution’s case. If necessary, they will take it to trial where they have decades of winning results. Call (248) 263-6800 or complete a Request for Assistance Form and one of the firm’s attorneys will be in touch. If you are being charged with a serious crime, you need a serious attorney by your side who is NOT AFRAID TO WIN!